For this cow, it must have seemed like a fairy tale of New York. For the slenderest moment yesterday, he trotted triumphantly through the sunny streets of Queens. Running, braying, even enchanting onlookers who soaked up the surreality of it all. "It was very nice to see a cow running through the streets," Claudia Escobar told the New York Post. It was, in all likelihood, nice to be a cow running through the streets. Police arrived on scene - although they weren't immune to this cow's unbridled enthusiasm for life, tweeting, "How cow! 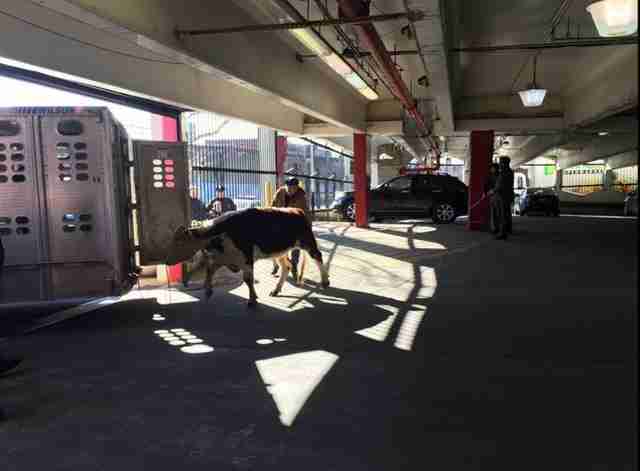 It seems the @NYPD103Pct will stop at nothing to keep traffic moooving." The cow wasn't hard to corral. In moments, police had loaded him into the back of a truck. And that briefest fairy tale of New York seemed to arrive at the most abrupt of endings. 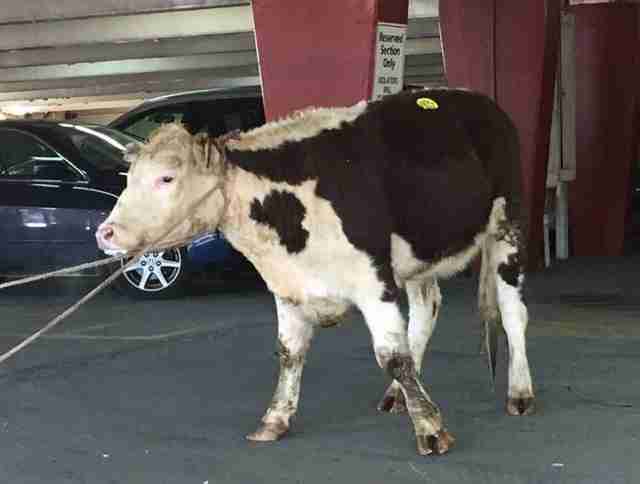 "The cow will be killed tomorrow," a worker at Jamaica Archer Live Poultry and Meat Market told the Post after the cow disappeared into the building. Because, apparently, the slaughtering goes down every Friday. Then a man who really, really loves animals (especially cows) called. As founder of Skylands Animal Sanctuary and Rescue, Mike Stura has been hauling animals in need to his 200-acre stretch of paradise since April 2015. In fact, the first of the 60 or so animals to set hoof on the New Jersey farm was a cow named Jimmy. Stura immediately hooked up his trailer and started driving towards Queens. The man at the other end of the phone, however, wasn't inclined to hand over the errant cow. In fact, the cow had been reserved by another family, for meat. But Stura was already behind the wheel, trailer in tow, hell bent on bringing that cow home. 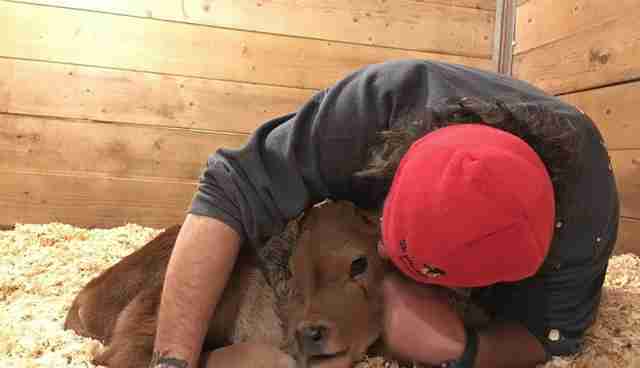 The man at the slaughterhouse told him he would ask the buyers if they might give up the cow. He called 15 minutes later to tell Stura they refused. Did we mention Stura was already on his way? "We spoke a couple more times," he tells The Dodo. "It went good. Then it didn't go so good." 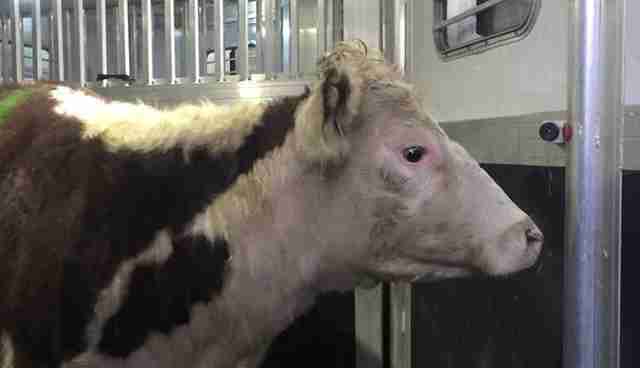 He arrived at the slaughterhouse in Queens at around 7 p.m. yesterday. No one was there. "So I stayed there in my truck for the night." When the workers filed into the slaughterhouse this morning, Stura was waiting for them. Time and time again, Stura has managed to get slaughterhouse operators to see things his way. Maybe it's the warmth and genuine compassion this man exudes. Or maybe it's his imposing figure - a big man with some serious ink makes a serious statement, even if it's belied by his otherworldly sense of calm. He managed to persuade the slaughterhouse owner. This morning, Stura got his cow. "He's in the back of my truck right now and I'm on my way to the veterinarian to get him checked out," he says. A little later today, the cow will arrive at Skylands. He already has a name. Freddie. Skylands is calling. The fairy tale has just begun. Want to help Skylands in its mission to give every animal a fairy tale ending? Sponsor an animal or make a donation here.